MAC Extra Dimension eyeshadows-they're back and permanent! Surely MAC's most instagrammable eyeshadows ever? MAC Extra Dimension eyeshadows are the most amazing formula and now they're back and permanent! I had a very impromptu splurge on the above five because basically I am weak and they are shiny. They're beautiful to look at but thankfully they're not style and no substance-the formula is one of the very best I have tried. 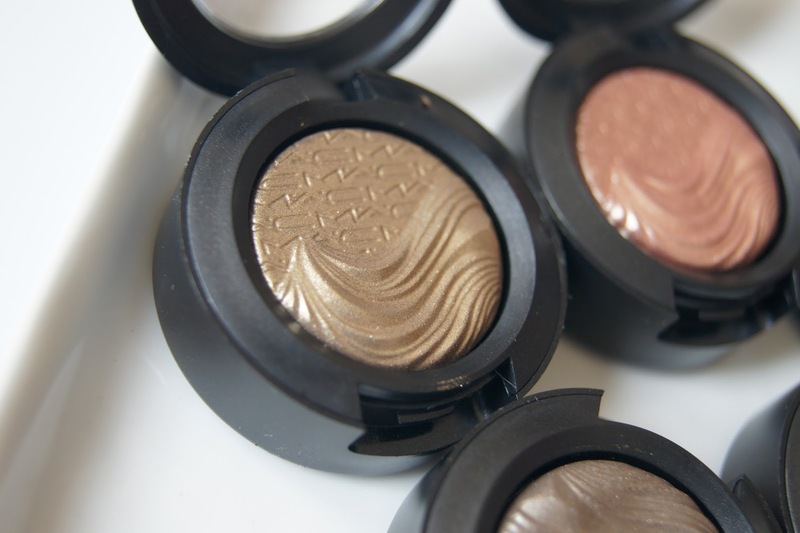 MAC describe the formula as a liquid-powder and the shadows are packed with pigment with a metallic finish. They're incredibly reflective yet don't contain any glitter or microshimmer. The formula is incredibly smooth and a delight to blend and I just love them. I wish MAC did palettes of this formula! They're not dissimilar to the NARS Dual Intensity eyeshadows but I do think the MAC formula has the edge. The pigment can be intensified by using them wet-this amps up the metallic foil like finish. I spritz my brush with MAC Fix Plus (newest purchase and addiction) and use the damp brush to pat the shadow onto my lids. Have you tried these eyeshadows? Do you love them as much as I do?